How long will I wait for my eyeglasses? Eyeglasses can be ready in as little as 1 day! Single vision lenses are generally back from our quality labs in 7-10 days. Progressive lenses are generally completed to our high standards in 3 weeks. We provide special consideration for rush orders/urgencies and many can be manufactured and delivered to you in under 24 hours. How do I clean my anti-reflection coated lenses? Use eyeglass spray cleaner formulated for anti-glare lenses. Apply the cleaner to both sides of the lens, gently rub it around with your fingers, and then dry the lenses with a soft cloth. Paper products should be avoided. The finishing touch for cleaning should be made with your high tech antistatic cloth. Polish the lens with this, it will remove smudges and bring the lens to a shine without creating static, which attracts dust. Ideally, your glasses should be cleaned and adjusted every three to four months. Doing so will ensure that your frames and lenses are properly aligned for optimum performance. In addition to the adjustment procedure, we will also clean your glasses on site ultrasonically. Can I get clip-on sunglasses for my frames? We can make custom clip-on sunglasses for virtually every frame we stock. Can I put new lenses in my current frames? In most cases yes, but we need to examine your existing frames to ensure a successful outcome. Also, parts may be hard to get for an older frame. Are my glasses made locally? 98% of our work is sent to three local labs. Do I have to be a patient to get glasses at your office? 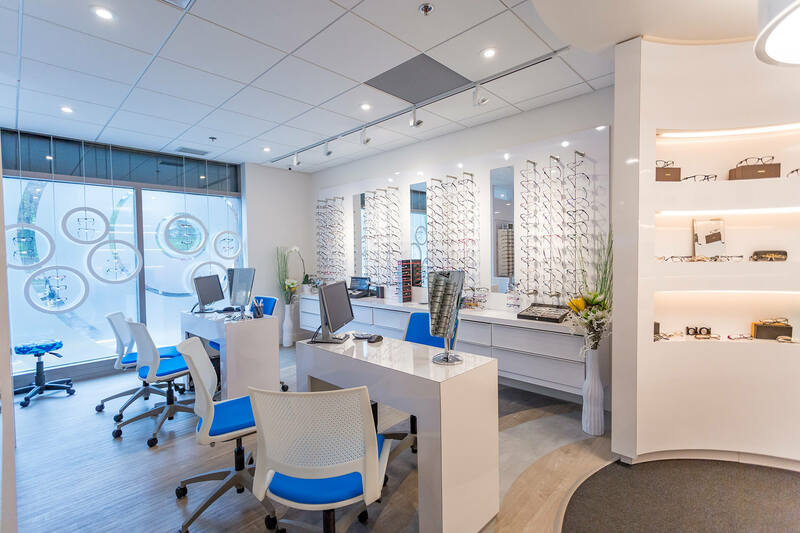 Spot Eyewear welcome patients from any Optometry clinic. Just ensure you have a copy of your most up-to-date prescription. Absolutely! Our selections include the top designer brands from around the world. Styles range from practical to fashionable and even the avante garde. How long does it take to get used to my new prescription? Normally, a couple of days at most with single vision lenses and up to a couple of weeks for a progressive lens. But remember… everyone is different. These eyeglass lenses are divided into an upper half that corrects for distance vision, and a lower half that corrects for near vision. Progressive lenses have a progression in power from top to bottom that allows short, medium, and distance viewing. There are no visible lines on the lens. These lenses are an excellent choice for people who multitask.